I would like to say to anyone exploring and contemplating joining the Southside CSA, you will not be disappointed! Likely you are doing research because enjoying freshly harvested, vibrant and tasty local fruit and vegetables is important to you and your happiness! It took me many years to take the plunge, and you may possibly share some of my early hesitations. Can I utilize all of the food before it goes bad, will any of it go to waste, will it be overwhelming? I decided this was the year for many reasons, but I took it on as a challenge and I am so glad I did. You have the opportunity to experiment with a variety of vegetables, taste some you have never even heard of, and give your body the super nutrients that come from these fresh earth-borne delicacies on a regular basis. You eat (certainly with some supplementation) according to the seasonal clock which is great for you as well as the local farmers and the environment. My personal challenges were to cook more, utilize more variety, spend less, try recipes outside my comfort zone, and get way more of the good stuff in. Although I swear I have been experimenting way out of my comfort zone, this week may be slightly less optimistic in terms of creativity as we are headed for a holiday and want to make sure we use everything before we leave. So I will dub this ‘realistic week’. The night we picked up our share we were starving (which is quite often the case) so we chose the easy route. Fast, easy and filling! 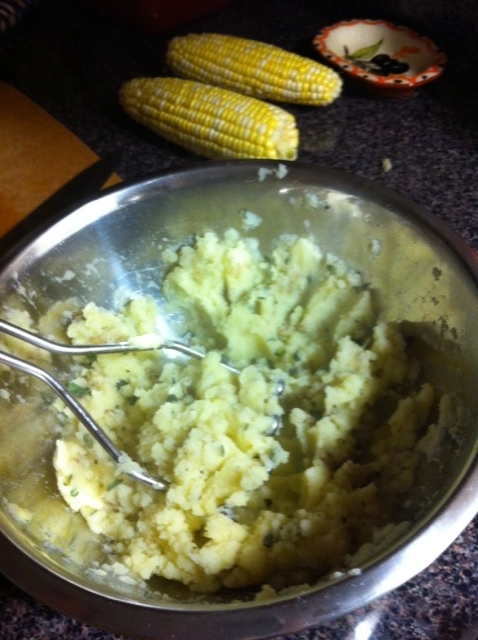 Steamed Spanish corn and sage mashed potatoes. At the beginning of the summer we planted herbs on our fire escape, which I highly recommend for vertical dwellers. The herbs had their ups and downs since May but the sage was truly the stand out consistent survivor and it is also delicious. 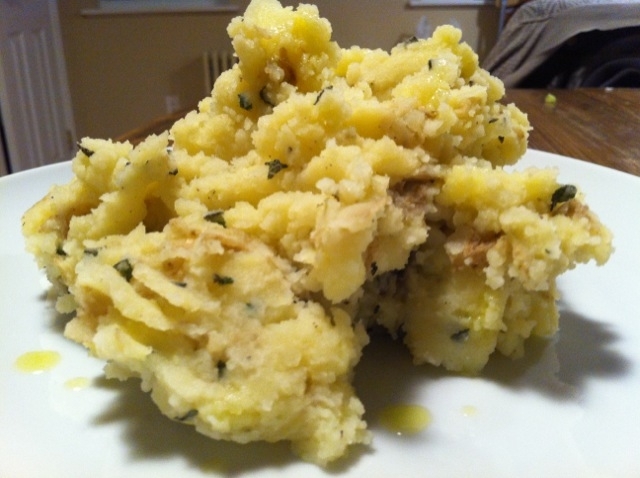 I found that simple mashed potatoes come alive when you add sage (as well as many other dishes). We simply boiled the spuds in salted water. Andy saved the salted water to whip with the potatoes. It is a great trick to create a creamy consistency without overusing fat (oil, butter) or added salt. We just chopped our sage and put it right in tonight with a little olive oil, salt and pepper but earlier in the summer we did try frying and salting the sage which is really tasty! I decided I want to jazz the corn up a little. 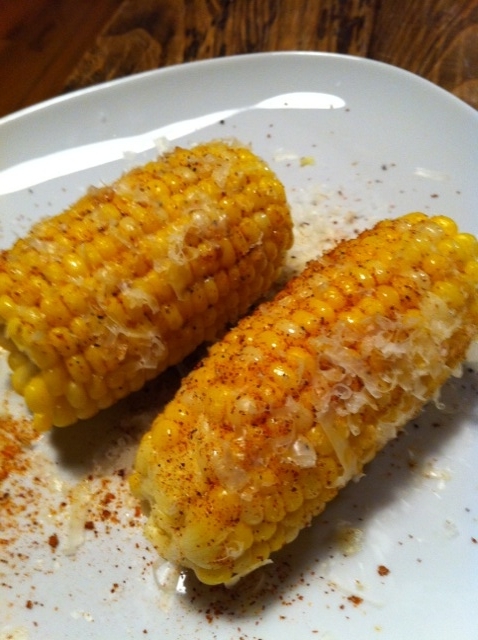 Typically a meal begins with what we may have in the refrigerator so I made a “Spanish” version of Mexican corn with olive oil, Spanish paprika and Manchego cheese. It was especially tasty complimenting such wonderfully sweet corn. This was not the most balanced of meals but surely satiated everything we were trying to accomplish: convenience, hunger and taste! The night we pick up our share and after gobbling down the first meal, I typically write myself an e-mail with the list of what we received so that I can do some research on new and exciting recipes to utilize everything. Since I am not someone who is a natural at experimenting, I go to the cookbook or internet for some ideas. I have found that after I have been in this rhythm for the last 5 months, I have felt a little more comfortable to experiment on my own. Typically we try to utilize a few of the main ingredients on the second or third night of the week. 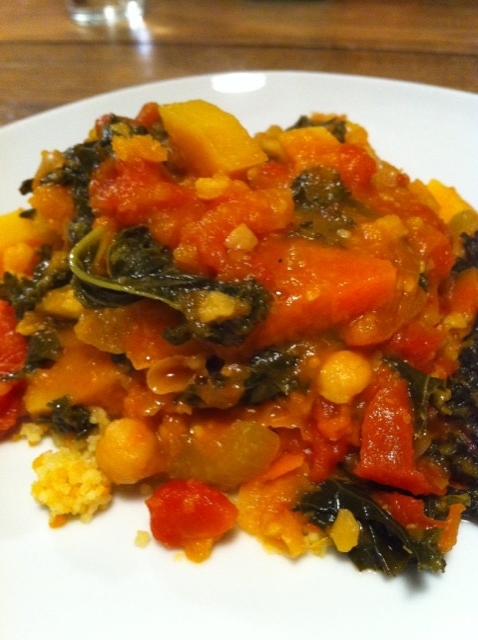 Using the butternut squash as the key component, we made a vegetarian Moroccan Tagine which was delicious. I found a great recipe on Allrecipe.com and highly recommend. It calls for chicken (or lamb) but since Andy is vegetarian we made a meat-free version. Although I swing both ways, I am perfectly happy with a largely plant-based diet. 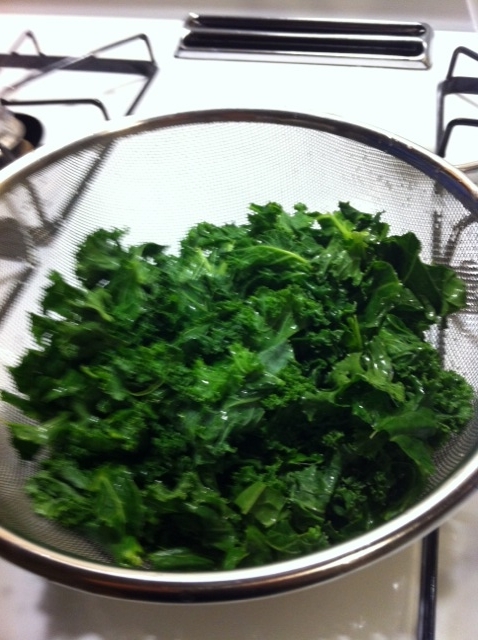 Our only variance to the recipe was adding celery and fresh kale from the farm! It’s a hearty stew which is usually accompanied (and we obliged) by cous cous. 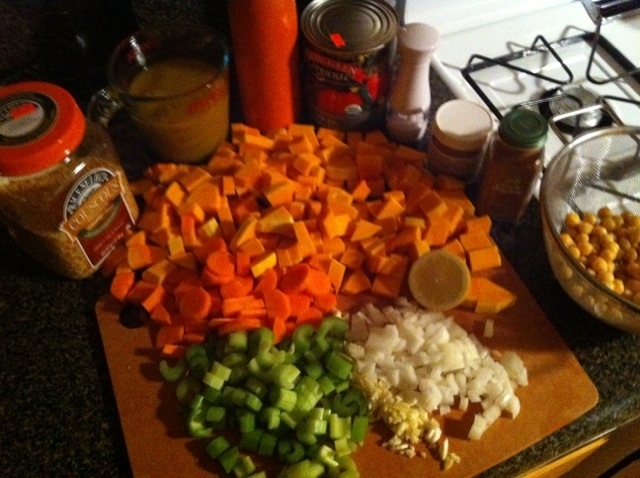 Ridiculously easy, you basically add all the components to the pot and cook. If you do the prep, its one step! It saves really well and we found that it is even better the next day, so make a lot and you will have a few more meals for the week. For us, that is key and helps us utilize everything in our share and make it last. I am going to take this opportunity to cheat slightly. Although we did receive plenty of apples this week (I could have easily created this week), I cannot lie this was a dish I made a couple of weeks ago. I so badly wanted to share. I am NO baker and this was my first foray into the field. 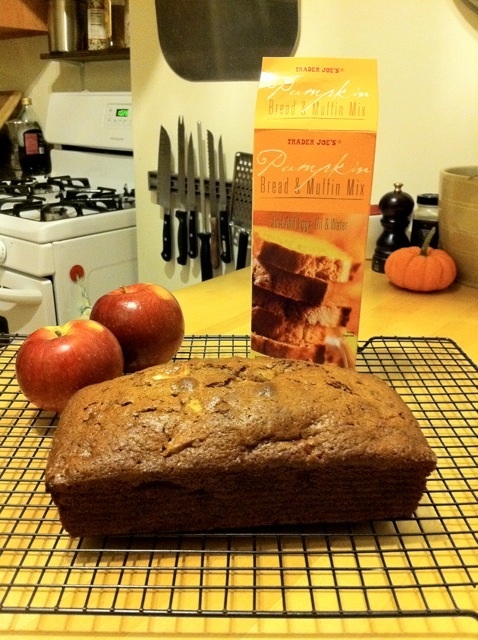 A few weeks back our share had the most beautiful apples and mini pears (not sure the name) so in my desire to have nothing go to waste, I started researching something I could bake utilizing all of the orchard bounty. I did want to challenge myself right? 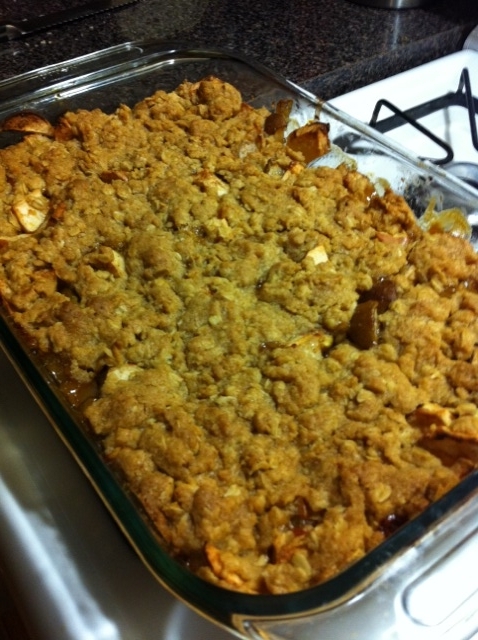 Although not so difficult, (baby steps) I found a fabulous recipe for Apple/ Pear Crisp by Ina Garten. It turned out better than I expected, even without a mixer, and I was left with a feeling of accomplishment. Everyone at work enjoyed the ‘fruits’ of my labor. I will surely try this one again. We simply ate the apples we got this week. 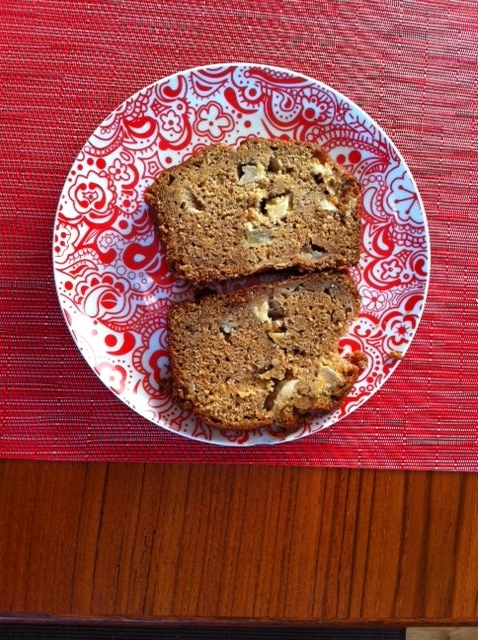 Karen, who truly is a baker, jazzed up a simple pumpkin bread with fresh apples. 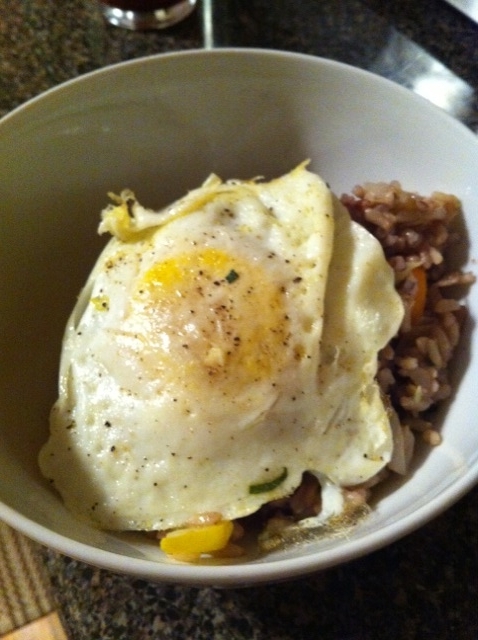 The recipe also utilized 2 of the fresh farm eggs. Super easy (about 5 minutes added to bake time) and makes your whole house smell delicious. Great for breakfast. 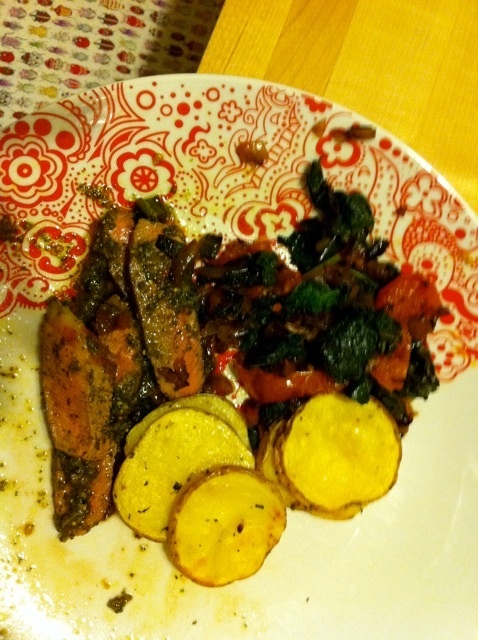 Utilizing peppers, kale, potatoes, parsley and tomatoes from our share this week, Karen crafted a beautiful dish. Lamb with a Parsley-Mint sauce and oven roasted potatoes and kale with onions, pepper and roasted tomatoes. (I told you she is a rocking cook). She admitted that she was halfway through eating before she remembered to photograph the dish! The photo may not capture the full beauty of her creation. “I scrubbed and sliced potatoes to about 1/8″ thick and tossed with a little oil and seasoning and baked at 375 for 35 min. I put tomatoes wedges at the end of baking sheet – roasted them and added to kale. I sauteed minced red onion and one of the peppers we got this week until softened and then added chopped kale. I covered the pan and cooked at med heat for about 7min – depends how cooked you like your kale. I added the tomatoes when they came out of the oven. I don’t know the cut of lamb I got – I went to the Meat Hook and asked for lamb for two people. I seared the steak on both sides about 2-3 min then baked in 375 oven for 4 min for med rare. Dave made the sauce the night before from the following recipe. The night before, Dave used a spicy dry rub on chicken cutlets, seared them and served with this sauce (found recipe online). Very tasty. Have enough leftover sauce for a third meal. Froze the last portion for tasty treat in the dead of winter. Place the mint, parsley, garlic and serranos in a food processor and process until coarsely chopped. Add the honey and mustard and process until combined. With the motor running, slowly add the olive oil until emulsified. Transfer the mixture to a bowl and whisk in a few tablespoons of cold water to thin to a sauce-like consistency. Season with salt and pepper to taste. As far as the lemongrass goes, we all were pretty perplexed on how to use. We had some great ideas, steam fish with it, make tea, add it to tofu, but I think Karen has been the only of us to take a crack at it. She also has been freezing it, hopefully to utilize in the future. Speaking of storing, I have many freezer bags of berries from the summer when we were receiving so many. I am very excited to have fresh berry smoothies in the winter months, knowing they are still chock full of nutrition. Eggs. They are amazing! Absolutely nothing like what you get from the supermarket; beautiful golden yokes with a freshness that is beyond compare. Andy does not eat eggs so it is up to me to eat the half dozen we get every 2 weeks. I typically like to fry an egg and put it over any grain (brown rice, faro, quinoa, cous cous)/ vegetable dish so it can run right into my dish. I love it! 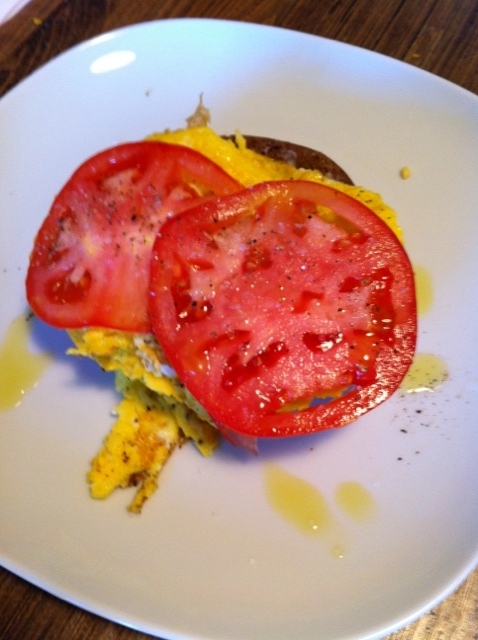 Also lately, I have been making scrambled eggs with the juicy tomatoes from the farm with drizzled olive oil and coarse salt to complete. 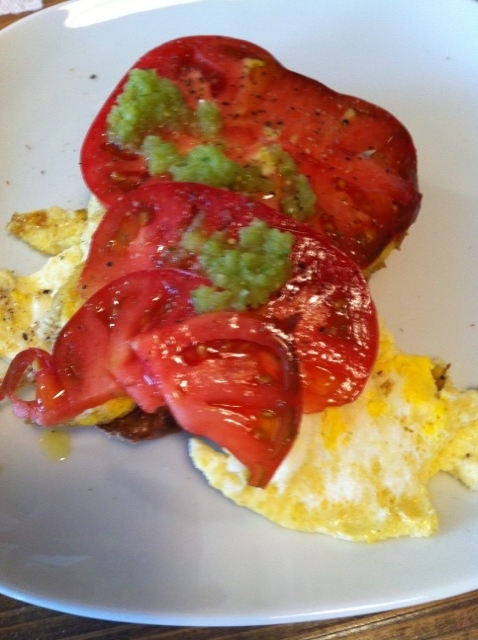 We made a jalapeno salsa from the jalapenos & tomatillos from a few weeks back and I have been topping my breakfast with that as well. Below are a few of my concoctions. I hope you enjoyed, we sure did. 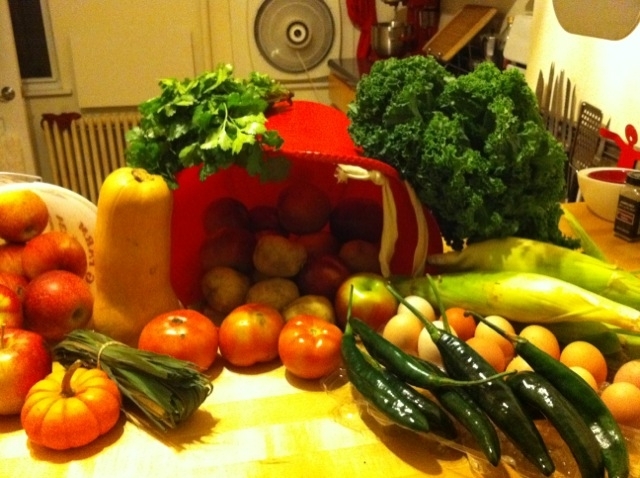 Happy fall bounty to all!